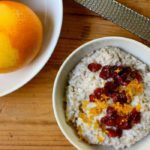 If you’re bored with plain oatmeal in the morning, then try this cranberry orange oatmeal recipe. Orange and cranberries add a sweet, zingy kick to your traditional bowl of oats — what better way to start the day? Add a sweet, zingy kick to your morning oatmeal with orange and cranberries. Bring water and salt to a boil in medium saucepan over medium-high heat. Reduce heat to low. Add oats; cook, stirring frequently, for 15 to 20 minutes, or until water is just absorbed. Remove from heat. Add orange peel. Let stand for 1 minute. Add cranberries, honey (if desired), and cinnamon; mix well. If too thick, add orange juice.